Sharon Auberle is a poet and photographer. She loves water and winter, the subjects of many of her poems, and is happy to be back in the land of her roots—the Midwest—after nearly twenty years in the drought-stricken Southwest. 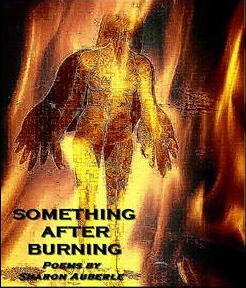 Sharon is the author of three poetry books, two of which also contain her photos, as well as several collaborations of her photos with other poets. 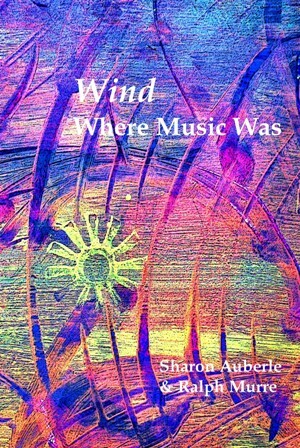 She and Ralph Murre are happy to announce the release of their new combined venture into poetry: Wind Where Music Was. 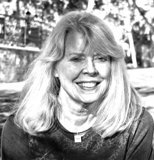 When not writing or out in the woods, Sharon can be found on Facebook or hanging poems and pictures at her website, Mimi's Golightly Café. She freely admits that both take time away from her poetry. Learn more about Sharon here. Our phrase, Sharon, was "pretend like..." and oh, the places that could take us to. And still does. Thanks for the reminder. Just a bit of peace in the old walled town, lovely poem, thanks Sharon. Excellent, as always. And maybe, just this once, the snow won't begin to drift. It's been near two weeks, now. I am a Sharon Auberle fan. Another lovely poem. Donna Hilbert. Your rogue heart--a conjurer that makes magic happen. It's raining here today as I munch on grapes and sit on that sunny wall. I could stay here for hours. Fine poem Sharon. I'm with Sharon. What's next is always a surprise, even if it isn't Tuscany. Lovely. The world is our imagination. beautiful, Sharon. I think I'll go back to Santiago for lunch. Well done, Sharon. I think I will let my rogue heart take me to Venice or London or San Miguel de Allende for a while this morning! love the rogue heart, sharon! very nice poem. I love the way this poem works its way to its final, almost jarring, image--which is, nevertheless, as serene as the Italian landscape the speaker imagined. This is an exceptionally well-crafted poem: simple but profound.